Widely known in the business community, this exclusive gated resort is a preferred by many south east coast companies,who choose these accommodations for university symposiums, business conventions and seminars, and company or group vacations. Choose a spacious vacation condominium, lodge or villa with all the amenities you need readily available. Condo options range from large guest rooms in beachfront towers to four-bedroom villas, many with full kitchens and washer/dryers. Imported “Black Swans” are residents you’ll enjoy seeing throughout the lushly landscaped 145 acres of Kingston Plantation. Acres upon acres – twenty approximately – of lakes, ponds and water features enhance the beauty of the property, and many of the condos enjoy views of these delightful amenities. Enjoy extensive walking trails with delightful wildlife, as well as fishing freely in all the lakes without the bother of permits. Direct beach access and other water activities include more than fifteen private and community swimming pools. Enjoy the gigantic, fifty thousand square-foot waterpark called the Splash Pool Complex. This family-friendly resort amenity comes complete with mulitple waterslides, winding Lazy River, water spouts, gigantic water bucket, two large swimming pools and two kiddie pools, and three jacuzzis. Free summer activity programs for the children are sure to entertain your little ones while you are busy relaxing or working. Oceanfront Tower pools have cabana Rentals, TV’s, and Wi-Fi. Enjoy usage of the Pools and Amenities including room service and a Starbucks at the nearby Hilton and Embassy Suites Hotels. Two outdoor snack bars, The Omaha Steakhouse and The Fisheye Grill as well as three lounge and bar options offer many opportunities for food and refreshments. A beachfront bars offers live music for entertainment. There are four oceanfront condo towers in Kingston Plantation’s resort complex which share and amenities with the Embassy Suites Hotel. If that’s not enough to make you happy, there’s a fabulous Fitness and Exercise Complex as well as a72-Par Championship Arrowhead Golf Course for you to take advantage of! 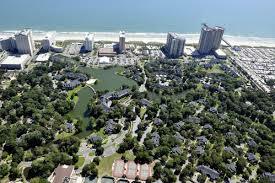 Kingston Plantation Condos on the Grand Strand are privately owned condos managed by the Hilton group and located in north Myrtle Beach, South Carolina. Nestled on 145 lush acres and enjoying a mile-wide expanse of Myrtle Beach, these condo rentals and vacation villas are very to all the famed Myrtle Beach area activities, attractions, fine dining and award-winning recreational opportunities that you desire. Beautiful townhomes in Kingston Plantation, Canterbury Court Villas feature garages, screened in porches for outdoor enjoyment and relaxing jacuzzi tubs. Cumberland Terrace Condos are two bedrooms with lofts and delightful spiral staircases. Gloucester Terrace Condos are near the Embassy Suites Hotel, with two- or three-bedroom floor plans featuring open, cathedral ceilings, enjoyable sunroom, and outdoor patio. Closest to the Hilton, the one- two-, and three- bedroom units in the Richmond Park Villas enjoy their own large community pools and encircle Arrowhead Lake for lovely views and convenience to fishing. St. James Park Villas feature convenient outdoor storage for your sporting goods and beach gear, as well as carports to go along with these one-, two- and three- bedroom condos, peacefully located between two of the resort lakes on the south side of the property. The park-like setting with a variety of flowering and live oak trees of Hyde Park feature one- two-, and three- bedroom condos with comfortingly warm wood-burning fireplaces to enjoy. Very private, two-bedroom, two bath condos with single level or townhouse floo rplans feature large screened-in porches for your protected enjoyment of the outdoors as well as relaxing and soothing jacuzzi tubs are found at the Windsor Court Villas. Located near the Embassy Suites on a lake, Windermere By the Sea at Kingston condos have spacious two- and four-bedroom floorplans, also with Jacuzzi tubs, and enjoy a shared community pool. Glouchester on the Point Condos’ two-story townhomes offer a delightful lake side position for easy access to fishing and are just a moment’s walk to the beach to enjoy the white sandy expanse next to the sparkling Atlantic Ocean. Laurel and Arrowhead Lodge Kingston Plantation lodges are near the convention center and a convenient walk to the Royale Palms tower as well as the Myrtle Beach Hilton as well as almost every amenity in the community. These buildings are set on the shores of Lake Arrowhead for a beautiful setting and peaceful feel. South of The Embassy Suites, the Brighton Tower at Kingston is a 21 story high-rise with luxury in-unit amenities like gorgeous marble floors, solid granite countertops and spacious, open living areas with fantastic views. The Margate Tower at Kingston is a 29 story high-rise boasting large residences averaging over 2400 square feet, luxury appointments, incredible amenities and breathtaking views. Two side-by-side oceanfront towers named the North Hampton at Kingston and South Hampton at Kingston have extra large balconies for your enjoyment of the Southern Carolina seaside. The North Hampton also includes security intercoms, an indoor pool, and private parking for your convenience. Yet another highrise oceanfront tower at Kingston Plantation is the Kingston Royale Palms, convenient to the Myrtle Beach Hilton. Shared amenities of this tower includes private cabanas for rent, a sandy bottomed kids playpool, and a lazy river to lounge in as well as two more pools. The Kingston Plantation has been awarded TripAdvisor’s 2013 Certificate of Excellence. Currently available condominium units at the Kingston Plantation are priced from the low $200’s to just under $500K. Like no other vacation and residential complex in Myrtle Beach, your investment in a vacation or real estate at Kingston Plantation gives you ownership in a a resort with an extensive list of impressive features, amenities and services that has pleased visitors worldwide. The luxury beach accommodations here are extremely popular, with great rental income. If you are ready to investigate making Kingston Plantation Resort your next vacation home and investment property, give us a call today for your personal tour of your favorite available properties in this fantastic luxury resort.